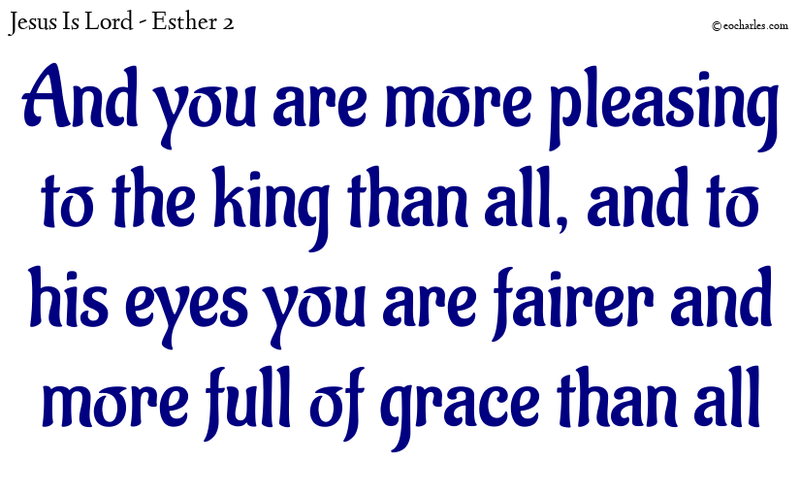 And Esther was more pleasing to the king than all the women, and to his eyes she was fairer and more full of grace than all the other virgins: so he put his crown on her head and made her queen in place of Vashti. 1)Luk 14:21 And the servant came back and gave his master an account of these things. Then the master of the house was angry and said to the servant, Go out quickly into the streets of the town and get the poor, the blind, and those who are broken in body. that is how you are more pleasing to him than all. and more full of grace than all. especially when the world tries to tell you different. 1. ↑ Luk 14:21 And the servant came back and gave his master an account of these things. Then the master of the house was angry and said to the servant, Go out quickly into the streets of the town and get the poor, the blind, and those who are broken in body.